Even though gPodder.net only unfolds its full potential (Seamless Playback on the Go and more) with compatible apps (gPodder), it also offers publishing your personal OPML-file containing your podcasts. 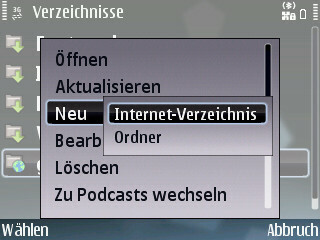 This is especially useful with Nokia Podcasting as it makes importing your Podcasts over-the-air very easy. No more copy’n’pasteing URLs to Podcasting or manually sending OPML-files via Bluetooth. First get started with gPodder.net (install the desktop client to add your first device so that you can subscribe to podcasts This schould no longer be necessary). 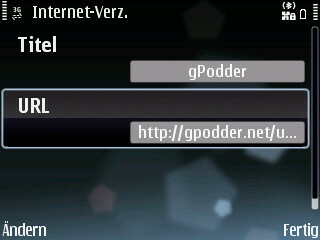 Then publish your OPML-File or get the private URL to your Phone (http://gpodder.net/share/ symbian can do copy’n’paste since ages, remember ? ;-)). 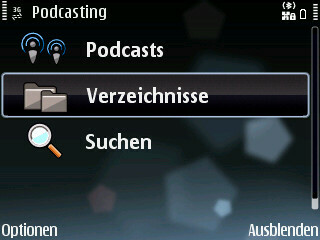 Update: Just add ?symbian=true#.opml to get an OPML made specifically for Nokia Podcasting. 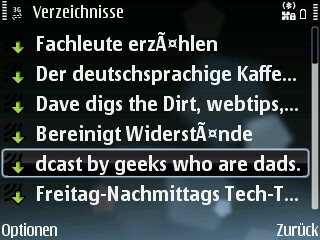 Start Nokia Podcasting on your phone (available on any Nokia Symbian phone) and Go to „Directories“. Now add a new „Web Directory“ using the URL to your gPodder OPML-file.